- Publisher Not so long ago it would have been fair to say that Christian faith played a leading role in cultural life. Today, however, culture has become largely "detraditionalized"; the impact of faith on society is minimal at best. This insightful book looks at the chasm that has opened up between faith and culture and exhorts Christians to reengage society in meaningful ways. According to Lieven Boeve, every new age challenges the Christian tradition to recontextualize its presentation of meaning and purpose. Today's postmodern world may be an especially difficult setting for faith, yet it too affords Christians many opportunities for dialogue. In the first part of the book Boeve provides a pithy description of the vicissitudes of the Christian tradition in modernity and postmodernity. The second part of the book uses this background to equip Christians to reflect on their faith in a credible and relevant manner without withdrawing from the contemporary world. - Publisher Not so long ago it would have been fair to say that the Catholic Church and the Catholic faith determined human life and social existence, more or less unquestioned, in Flanders and in a large part of Western Europe. The Catholic faith community in Flanders today, however, is struggling with the fact that the transmission of the Christian tradition has been flagging in recent years. This has not only led to diminished faith engagement and a massive decline in church attendance, it has also had its effects in the cultural domain: culture has become de-traditionalised; 'traditional' Christian culture is worn out. Even convinced Christians are having problems reflecting on the plausibility of their faith, precisely because of the chasm that has opened up between faith and culture. About "Interrupting Tradition (#30 in Louvain Theological & Pastoral Monographs Series)"
Not so long ago it would have been fair to say that Christian faith played a leading role in cultural life. Today, however, culture has become largely "detraditionalized"; the impact of faith on society is minimal at best. This insightful book looks at the chasm that has opened up between faith and culture and exhorts Christians to reengage society in meaningful ways. According to Lieven Boeve, every new age challenges the Christian tradition to recontextualize its presentation of meaning and purpose. Today's postmodern world may be an especially difficult setting for faith, yet it too affords Christians many opportunities for dialogue. 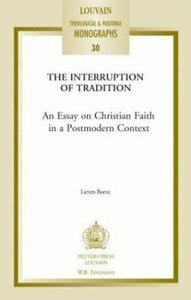 In the first part of the book Boeve provides a pithy description of the vicissitudes of the Christian tradition in modernity and postmodernity. The second part of the book uses this background to equip Christians to reflect on their faith in a credible and relevant manner without withdrawing from the contemporary world. Not so long ago it would have been fair to say that the Catholic Church and the Catholic faith determined human life and social existence, more or less unquestioned, in Flanders and in a large part of Western Europe. The Catholic faith community in Flanders today, however, is struggling with the fact that the transmission of the Christian tradition has been flagging in recent years. This has not only led to diminished faith engagement and a massive decline in church attendance, it has also had its effects in the cultural domain: culture has become de-traditionalised; 'traditional' Christian culture is worn out. Even convinced Christians are having problems reflecting on the plausibility of their faith, precisely because of the chasm that has opened up between faith and culture. Lieven Boeve is professor Fundamental theology at the Faculty of Theology, K.U. Leuven (Belgium). He is also co-odinator of the research group Theology in a postmodern context.